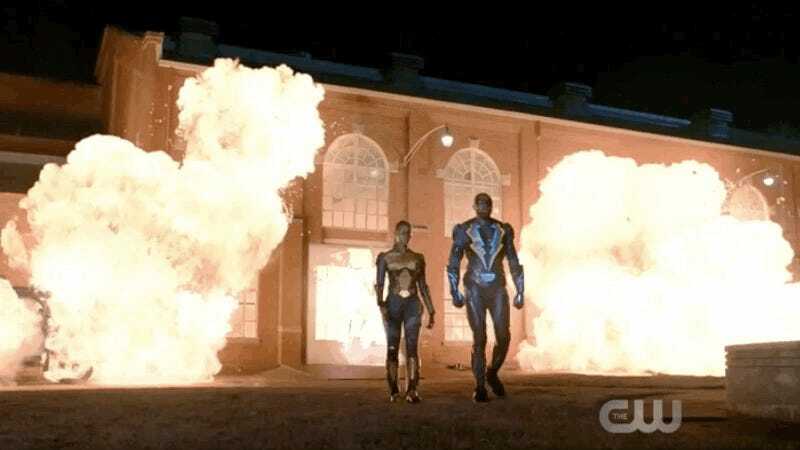 Thunder and Black Lightning leaving behind an exploding drug lab. Unlike most the CW’s other superheroes who often rely on a close-knit network of allies who assist them when their vigilante work gets to be too much, we’ve really only ever seen Black Lightning working with one or two other people. Now, though, Jefferson’s finally getting something like a team of his own—and he just happened to be related to all of them. 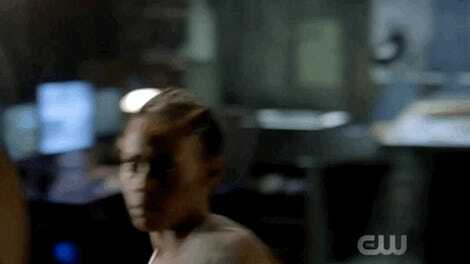 It’s always great when Black Lightning takes a minute to slow and focus more on the Pierce family dynamics, if only because the show’s cast has phenomenal chemistry, something you can clearly see in “The Book of Little Black Lies.” Now that everyone knows that Jeff’s Black Lightning and both Anissa and Jennifer inherited their father’s activated metahuman gene, the Pierces are at an impasse. While Jeff is subtly pleased that she takes after him, Jennifer’s reaction to discovering her ability to zap and fry things is alarm rather than elation because in her view, being extraordinary means giving up the regular teenaged life she wants. If Anissa is the idealized version of a person who learned one day that they had superpowers and immediately became a superhero, then Jennifer is her much more grounded counterpart who doesn’t have that same calling to heroism because she understands the danger it entails. Though Black Lightning’s past few episodes haven’t spent too much time revisiting it, Jennifer’s still trying to cope with Khalil’s shooting during the anti-100 protest that left him paralyzed and eventually led to their breaking up. In that moment, both of their lives changed and she came face to face with the consequences of simply getting involved with superheroes and their enemies. It makes sense that, even with the support and acceptance of her sister and father, Jennifer might see her abilities as a burden that her family should have warned her about. It’s the secrecy and deception more than anything else that hurts Jennifer because she realizes that she’s the last to be in on the family secret, but Lynn points out the very legitimate reasons that she and Jeff never thought they’d have to tell their daughters. From left to right: Cress Williams as Jefferson Pierce, Nafessa Williams as Anissa Pierce, and China Ann McClain as Jennifer Pierce. Because Jeff wasn’t born with his powers, it stood to reason that there was a chance they wouldn’t be passed on genetically. Between fear that the children might have accidentally exposed him Black Lightning and Jeff’s eventual decision to retire from superheroism, it made sense for the Pierces to try and live regular lives. But it’s that kind of thinking—the drive to bury difficult truths rather than confront them in the open—that leads to family drama. Lynn, Jeff, Anissa, and Jennifer all know that on some level and, though they’re hurting, they choose to stick together rather than letting themselves be torn apart. 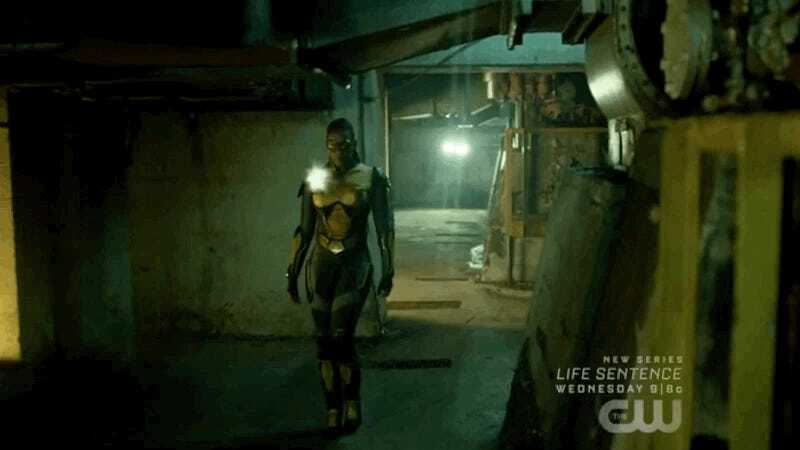 While Jennifer may not be clamoring to get a custom supersuit of her own from Gambi, “The Book of Little Black Lies” really does seem like the beginning of Team Black Lightning, the squad of on-the-ground heroes and remote support members who might just save Freeland. As Black Lightning closes in on another lead about the organization that created Green Light in an attempt to recreate the process that gave him superpowers, we see just what a force to be reckoned with Anissa/Thunder is. Unlike her dad who’s got to think quickly on his feet in order to use his electrical abilities to protect him from physical harm, Thunder’s a straight-up tank to walks into gunfire head-on and proceeds to wreck some goons without breaking a sweat. Their mission to take down the Green Light lab is one that either one of them probably could have handled on their own, but instead, they do it together and with Lynn and Gambi’s intel and tech that they’re able to get the job done flawlessly without getting hurt themselves. There are still four episodes of Black Lightning left this season and “The Book of Little Black Lies” points to the show’s closing act being an explosive one. With Latavius risen from the dead thanks to a spectral LaWanda White and a hit out on Black Lightning’s head, the war that’s coming Jeff’s way is only getting more and more serious—meaning that when the time comes, he’s going to need all the help he can get to protect his city. Thankfully, it looks like he has them. • Another week, another chance to speculate at just which universe Black Lightning might be set in. Lynn’s joke about being secretly being Vixen was funny, but it also suggests that Vixen isn’t just a comic book character in their world. To the comments section, my fan theorists! • Jeff rolling up wearing an Obama mask to shake down that criminal linked to Green Light is hands down one of the best television moments of the year. • Let’s talk about Thunder’s costume. How can something that’s so cheesy be so damned cool at the same time? I will never ever get tired of seeing bulletproof black people wiping the floor with people. Never.